Iowa State University researchers have developed micro-tentacles able to provide tiny robots with grip and dexterity for objects at the millimeter scale. The advance opens the door for a world of possibilities, from manufacturing to the operating table. Engineers at Iowa State University (ISU) have developed a new technology aimed to provide robots with even more precision and control when it comes to grip and dexterity through the use of microrobotic tentacles that can be used as hands or fingers in tiny robotics. Tiny robots could potentially achieve more grip and dexterity through micro-tentacles developed at Iowa State University. The spiraling microrobotic tentacles were developed by Jaeyoun Kim, an associate professor of electrical and computer engineering at ISU, and his team of researchers, who initially set out to explore unconventional microscale structures from soft materials like elastomers. They eventually gravitated toward these fabricated tentacles made from a transparent elastomer that can either be a liquid or a soft, rubbery solid substance. 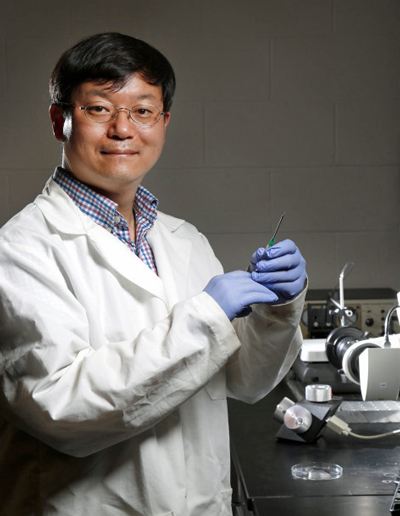 Kim, who has been working with the material for about a decade, has patented a process for making thin wires from the substance as part of his research, which focuses on micro-electro-mechanical systems. He remains cognizant of the potential of soft robotics and the impact they can have among emerging technologies. "Soft robotics is an emerging field and its future is still not determined yet," Kim said. "Few people want to have C3PO as their nurse or caregiver. Even fewer will be comfortable with rigid robots working on their bodies. Soft robotics won't compete with rigid robots, but they will certainly find their complementary niche and maintain it." Kim noted that most robots these days use rigid fingers to pick things up and squeeze, whereas this new tentacle technology can wrap around objects gently. The hope is that these tentacles can provide robotics with a better ability to handle delicate objects like arteries and tissue. It is the kind of dexterity that engineers have been striving for in both the manufacturing and medtech realms. "We would like to emphasize its novelty and safety," Kim said. "This is a new form of grabbing in the microscale world. So far, at that length-scale, grabbing means squeezing the target object with a two-finger manipulator, which inevitably deforms or even damages the object. Our tentacle can conformally wind around the object and scoop it up. It's a much safer, non-intrusive form of manipulation, and will become the main marketability of the invention." Kim went on to say that he believes soft robots, like his microrobotic tentacles, could be especially helpful when it comes to minimally invasive operations and intravascular procedures. The shape and size of the tentacle was specifically designed to prevent the technology from damaging small and delicate objects such as tissue and human blood vessels. Kim was quick to emphasize that the future of microrobotics isn't one where rigid and soft robotics necessarily compete with one another. Their group remains interested in exploring the overlap between microscale robotics and soft robotics, in an effort to better understand and enhance soft robotics as a tool that can reshape the world around us in exciting new ways. "Soft robotics can certainly give high levels of human-friendliness and biocompatibility," he said. "They will get their spot in healthcare eventually." Kristopher Sturgis is a contributor to Qmed and MPMN.